The portrait of Jiang Zemin. Jiang Zemin (born 17 August 1926) is a retired Chinese politician who served as General Secretary of the Communist Party of China from 1989 to 2002, as Chairman of the Central Military Commission from 1989 to 2004, and as President of the People's Republic of China from 1993 to 2003. Jiang has been described as the "core of the third generation" of Communist Party leaders since 1989. Jiang Zemin came to power unexpectedly as a 'compromise candidate' following the Tiananmen Square protests of 1989, when he replaced Zhao Ziyang as General Secretary after Zhao was ousted for his support for the student movement. With the waning influence of Eight Elders due to old age and with the death of Deng Xiaoping, Jiang consolidated his hold on power and became the "paramount leader" of the country in the 1990s. 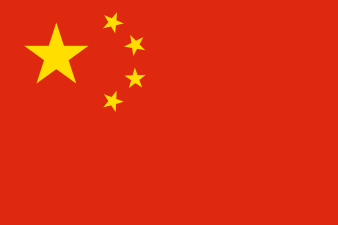 Under Jiang's leadership, China experienced substantial economic growth with the continuation of reforms, saw the peaceful return of Hong Kong from the United Kingdom and Macau from Portugal, and improved its relations with the outside world while the Communist Party maintained its tight control over the government. Jiang has been criticized for being too concerned about his personal image at home, and too conciliatory towards Russia and the United States abroad. His contributions to party doctrine, known as the "Three Represents," were written into the party's constitution in 2002. Jiang vacated the post of party General Secretary in 2002, but did not relinquish all of his leadership titles until 2005, and continued to influence affairs until much later. 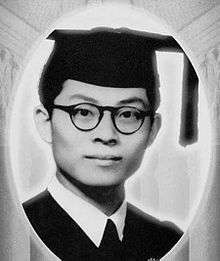 Jiang attended the Department of Electrical Engineering at the National Central University in Japanese-occupied Nanjing before being transferred to National Chiao Tung University. He graduated there in 1947 with a bachelor's degree in electrical engineering. Jiang married Wang Yeping in 1949, also a native of Yangzhou. She graduated from Shanghai International Studies University. They have two sons, Jiang Mianheng and Jiang Miankang. He claims that he joined the Communist Party of China when he was in college. After the establishment of the People's Republic of China, Jiang received his training at the Stalin Automobile Works in Moscow in the 1950s. He also worked for Changchun's First Automobile Works. He eventually got transferred to government services, where he began to rise in prominence and rank, eventually becoming a member of the Central Committee of the Communist Party, Minister of Electronic Industries in 1983. Jiang was elevated to the country's top job in 1989 with a fairly small power base inside the party, and thus, very little actual power. His most reliable allies were the powerful party elders – Chen Yun and Li Xiannian. He was believed to be simply a transitional figure until a more stable successor government to Deng could be put in place. Other prominent Party and military figures like Yang Shangkun and brother Yang Baibing were believed to be planning a coup. Jiang used Deng Xiaoping as a back-up to his leadership in the first few years. Jiang, who was believed to have a neo-conservative slant, warned against "bourgeois liberalization". Deng's belief, however, stipulated that the only solution to keeping the legitimacy of Communist rule over China was to continue the drive for modernization and economic reform, and therefore placed himself at odds with Jiang. At the first meeting of the new Politburo Standing Committee, after the Tiananmen Square massacre of 1989, Jiang criticized the previous period as "hard on the economy, soft on politics" and advocated increasing political thought work. Anne-Marie Brady writes that "Jiang Zemin was a long time political cadre with a nose for ideological work and its importance. This meeting marked the beginning of a new era in propaganda and political thought work in China." Soon after, the Central Propaganda Department was given more resources and power, "including the power to go in to the propaganda-related work units and cleanse the ranks of those who had been supportive of the democracy movement." The People's Daily and CCTV-1's 7 pm Xinwen Lianbo each had Jiang-related events as the front-page or top stories, a fact that remained until Hu Jintao's media administrative changes in 2006. Jiang appeared casual in front of Western media, and gave an unprecedented interview with Mike Wallace of CBS in 2000 at Beidaihe. He would often use foreign languages in front of the camera, albeit not always comprehensible. In an encounter with a Hong Kong reporter in 2000 regarding the central government's apparent "imperial order" of supporting Tung Chee-hwa to seek a second term as Chief Executive of Hong Kong, Jiang scolded the Hong Kong journalists as "too simple, sometimes naive" in English. The event was shown on Hong Kong television that night, an event regarded to be in poor taste outside China. Tong asserts that among the main features of Jiang’s domestic policy was his persecution of Falun Gong, which had 70 million practitioners in China. On 25 April 1999 upwards of 10,000 Falun Gong practitioners protested peacefully outside the Zhongnanhai government compound to request official recognition, in response to which Jiang declared the Falun Gong threat must be defeated. According to Human Rights Watch, Communist Party leaders and ruling elite were far from unified in their support for the crackdown. In June 1999, Jiang established an extralegal department, the 6-10 Office, to oversee the persecution of Falun Gong. On 20 July, security forces abducted and detained thousands of Falun Gong practitioners that they identified as leaders. The persecution that followed was characterized a nationwide campaign of propaganda, as well as the large-scale arbitrary imprisonment and coercive reeducation of Falun Gong practitioners, sometimes resulting in death. Under Jiang's leadership, the persecution of Falun Gong became part of the Chinese political ethos of "upholding stability" – much the same rhetoric employed by the party during Tiananmen in 1989. The scope and intensity of the campaign has been described as "unrivaled" in recent history, and as being reminiscent of the extremes of the Cultural Revolution. Falun Gong practitioners outside China have filed dozens of largely symbolic lawsuits against Jiang Zemin and other Chinese officials alleging genocide and crimes against humanity. Although courts have refused to adjudicate the cases on the grounds of sovereign immunity in many instances, separate courts in Spain and Argentina indicted Jiang and other officials on the charge of torture and genocide and asked for their arrest in late 2009. Ethan Gutmann interviewed over 100 witnesses and estimated that 65,000 Falun Gong practitioners were killed for their organs from 2000 to 2008. However, in 2016 former Canadian cabinet minister David Kilgour released a 680-page report indicting the harvest for a far higher death toll. Based on this Ethan Gutmann updated his numbers. Ethan Gutmann in the update estimates 60 to 110 thousand organs are harvested in China annually noting it is (paraphrasing): "difficult but plausible to harvest 3 organs from a single body" and also calls the harvest "a new form of genocide using the most respected members of society." If this is applied to the harvest count (60 to 110 thousand) then 20,000 to 36,667 are murdered annually for their organs and applied to the time harvesting has been going on (15 to 17 years) between 300,000 and 623,333 have been killed for their organs. Media outlets such as The Telegraph and Epoch Times extrapolated from this report an overall death toll for the 15-year period since the beginning of the organ harvesting of 1,500,000. Jiang Zemin with Bill Clinton in 1999. Jiang went on a groundbreaking state visit to the United States in 1997, drawing various crowds in protest from the Tibet Independence Movement to supporters of the Chinese democracy movement. He made a speech at Harvard University, part of it in passable English, but could not escape questions on democracy and freedom. In the official summit meeting with US President Bill Clinton, the tone was relaxed as Jiang and Clinton sought common ground while largely ignoring areas of disagreement. Clinton would visit China in June 1998, and vowed that China and the United States were partners in the world, and not adversaries. When American-led NATO bombed the Chinese Embassy in Belgrade in 1999, Jiang seemed to have put up a harsh stance for show at home, but in reality only performed symbolic gestures of protest, and no solid action. Jiang's foreign policy was for the most part passive and non-confrontational. A personal friend of former Canadian Prime Minister Jean Chrétien, Jiang strengthened China's economic stature abroad, attempting to establish cordial relations with countries whose trade is largely confined to the American economic sphere. Despite this, there were at least three serious flare-ups between China and the US during Jiang's tenure. The first was in 1996 when President Clinton dispatched warships to the Taiwan area during a period when the PLA appeared to be making threatening gestures. The second was the above-mentioned NATO bombing of Serbia and the third was the shootdown of a US spyplane over Hainan in April 2001. Jiang Zemin with wife and George W. Bush with wife in Crawford, Texas in 2002. Beginning in July 2011, false reports of Jiang's death began circulating on the news media outside of mainland China and on the internet. While Jiang may indeed have been ill and receiving treatment, the rumours were denied by official sources. On 9 October 2011, Jiang made his first public appearance since his premature obituary in Beijing at a celebration to commemorate the 100th anniversary of the Xinhai Revolution. Jiang reappeared at the 18th Party Congress in October 2012, and took part in the 65th Anniversary banquet of the founding of the People's Republic of China in October 2014. At the banquet he sat next to Xi Jinping, who had then succeeded Hu Jintao as party leader. In September 2015, Jiang attended the parade celebrating 70 years since end of World War II; there, Jiang again sat next to Xi Jinping and Hu Jintao. After Xi Jinping assumed power, Jiang's position in the protocol sequence of leaders retreated; while he was often seated next to Xi Jinping at official events, his name was often reported after all members of the Communist Party's Politburo. Some have also associated Jiang with the widespread corruption and cronyism that had become a notable feature of the Communist power apparatus since Jiang's years in power. In the military, the two vice-chairmen who sat atop the Central Military Commission hierarchy – nominally as assistants to then Chairman Hu Jintao – Vice-Chairmen Xu Caihou and Guo Boxiong, were said to have obstructed Hu Jintao's exercise of power in the military. Xu and Guo were characterized as "Jiang's proxies in the military." Eventually, both men were reported to have taken massive bribes, and both fell under the axe of the anti-corruption campaign of Xi Jinping. 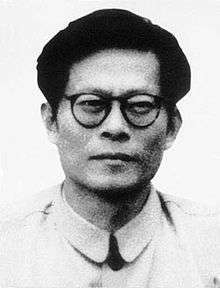 At the same time, many biographers of Jiang have noted his government resembled an oligarchy as opposed to an autocratic dictatorship. Many of the policies of his era had been attributed to others in government, notably Premier Zhu Rongji. Jiang was also characterized as a leader who was mindful to seek the opinion of his close advisers. Jiang is often credited with the improvement in foreign relations during his term, but at the same time many Chinese have criticized him for being too conciliatory towards the United States and Russia. The issue of Chinese reunification between the mainland and Taiwan gained ground during Jiang's term, but more substantial talks regarding Cross-Strait talks and the eventual Three Links occurred during the term of Hu Jintao. The construction of the Qinghai–Tibet Railway and the Three Gorges Dam began under Jiang. 1 2 3 The Epoch Times Editorial Board (July 6, 2005). "Anything for Power: The Real Story of China's Jiang Zemin - Chapter 1". The Epoch Times. Retrieved May 29, 2015. 1 2 Song Feng and Zhou Ping (April 13, 2011). "Jiang Zemin Mourns Fake Father". China Forbidden News. New Tang Dynasty Television. Retrieved May 29, 2015. ↑ The-Cambridge Handbook Contemporary China. Cambridge University Press. 2001. p. 326. ISBN 978-0521786744. 1 2 "Jiang Zemin – General Secretary of the CPC Central Committee". People's Daily. Retrieved 4 December 2010. ↑ "BBC: Profile: Jiang Zemin". BBC News. 19 September 2004. Retrieved 7 March 2010. ↑ Los Angeles Times: China Leans Heavily on Trouble-Shooter : Politics: Vice Premier Zhu Rongji's assignment is to cope with economic troubles, corruption, rural anger. ↑ "Book: Real Story of Jiang Zemin: Introduction(4)". Chinaview.wordpress.com. 25 August 2006. Retrieved 7 March 2010. 1 2 Kissinger, Henry (2001). "Chapter 17". On China. Penguin Press HC. ISBN 978-1-59420-271-1. 1 2 Anne-Marie Brady, Marketing Dictatorship: Propaganda and Thought Work in Contemporary China, Rowman & Littlefield Publishers, Inc.
↑ Michael E. Porter. The Competitive Advantage of Nations (New York, NY: The Free Press, 1990), p. 546. ↑ "Hong Kong Journalists Association: FOE Annual Report, 2001". Hong Kong Journalists Association. 9 August 2001. Archived from the original on 11 October 2014. Retrieved 11 October 2014. ↑ Ethan Gutmann, ‘An Occurrence on Fuyou Street’, National Review, 13 July 2009. 1 2 3 Spiegel, Mickey (2002). Dangerous Meditation: China's Campaign Against Falungong. Human Rights Watch. ISBN 1-56432-269-6. Retrieved 28 September 2007. ↑ Sarah Cook and Leeshai Lemish, ‘The 610 Office:Policing the Chinese Spirit’, China Brief , Volume 11 Issue 17 (9 November 2011). ↑ Ian Denis Johnson, "Death Trap – How One Chinese City Resorted to Atrocities To Control Falun Dafa", Wall Street Journal, Pulitzer.org, 26 December 2000. ↑ Congressional-Executive Commission on China, "Annual Report 2009", cecc.gov, 10 October 2009. ↑ David Ownby, 'Qigong, Falun Gong, and the Body Politic in Contemporary China,' in China's transformations: the stories beyond the headlines, Lionel M. Jensen, Timothy B. Weston ed. Rowman & Littlefield Publishers, Inc. 2007. ↑ Luis Andres Henao, "Argentine judge asks China arrests over Falun Gong", Reuters, 22 December 2009. ↑ Ethan Gutmann (August 2014) The Slaughter: Mass Killings, Organ Harvesting and China's Secret Solution to Its Dissident Problem, amazon.com; accessed 19 June 2015. ↑ "Bloody Harvest / The Slaughter — An Update". International Coalition to End Organ Pillaging in China(You Tube Channel). ↑ Xinhua:China's Jiang Zemin, Canada's Jean Chrétien discuss relations 21 October 2001. ↑ "Where is Jiang Zemin?". Financial Times. 1 July 2011. Retrieved 6 July 2011. ↑ "Jiang's Rumours of Death Spread". Nihon Keizai Shimbun. 6 July 2011. Retrieved 7 July 2011. ↑ "Is China's Ex-Leader Jiang Zemin Dead? Local Censors Don't Want Any Speculation". Time. 6 July 2011. Retrieved 6 July 2011. ↑ "Jiang Zemin Appears in Public Three Months After Media Reports of Death". Bloomberg. 9 October 2011. 1 2 "江泽民"太任性" 习近平再造中共". Duowei News. ↑ Miles, James A. R. (1997). The Legacy of Tiananmen: China in Disarray. p. 59. ISBN 978-0472084517. ↑ "杨继绳：江泽民三件蠢事声望大大下降". Duowei News. June 20, 2015. 1 2 "补牢意识形态 "大统战"修正三个代表？". Duowei News. June 6, 2015. ↑ "Hu Jintao's weak grip on China's army inspired Xi Jinping's military shake-up: sources". South China Morning Post. 11 March 2015. ↑ "China under Jiang Zemin". Facts and Details. 1 October 1928. Retrieved 7 March 2010. 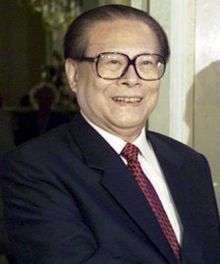 Wikimedia Commons has media related to Jiang Zemin.